Arguably the biggest drawcard of the delta is its colourful floating markets, which hug the banks of wide stretches of river. Most market folk set out early to avoid the daytime heat, so try to visit between 6am and 8am and beat the tourist tide. The real tides, however, are also a factor, as bigger boats must often wait until the water is high enough for them to navigate. Improved roads and public transport mean that some of the smaller, rural floating markets are disappearing, but many of the larger markets near urban areas are still going strong. Rural areas of Can Tho province, renowned for their durian, mangosteen and orange orchards, can be easily reached from Can Tho by boat or bicycle. It is quite an experience to see this in full swing, but it’s well worth getting up extra early to beat the tour-group crowds or you may end up seeing almost as many foreigners as market traders. Cai Rang can be seen from the road, but getting here is far more interesting by boat (US$6). From the market area in Can Tho it takes about an hour by river, or you can drive to the Cau Dau Sau boat landing (by the Dau Sau Bridge), from where it takes only about 10 minutes to reach the market. A boat trip here will require a 3.30am start (return 600,000d), but you need to arrange it the day before. It is theoretically possible to do a whirlwind boat trip, visiting the small canals on the way and finishing back at the Cai Rang floating market. This journey should take approximately five hours return from Can Tho. For trips on smaller boats (US$4 per hour), operators can be found along Ð Hai Ba Trung by the river, but inspect boats first; the faster alternative is to take a xe om or taxi and then hire a boat at the other end. (admission 20,000d; 5am-6pm) On the road between Can Tho and Long Xuyen, Bang Lang (also called Vuon Co) is a magnificent 1.3-hectare bird sanctuary with astonishing views of thousands of resident storks. 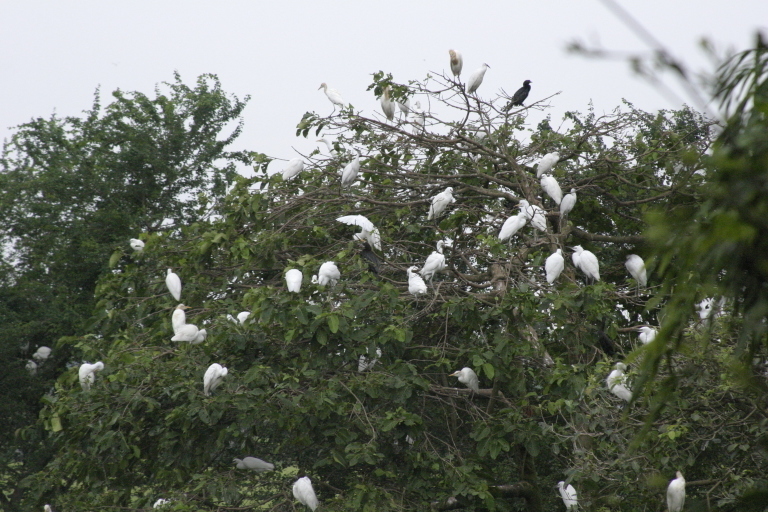 There is a tall viewing platform to see the storks filling the branches; it’s an absolutely incredible sight (the best times of day are around dawn and dusk). Bang Lang is in the Thot Not district, about 15km southeast of Long Xuyen. Look for a sign in the hamlet of Thoi An saying ‘Ap Von Hoa’. Coming from Can Tho the sign is on the west side of the road, immediately after a small bridge. It is a couple of kilometres off the main highway – reachable on foot within 30 minutes, or you can hire a motorbike taxi for about 20,000d.